How long has it been since you read a "feel-good" book? 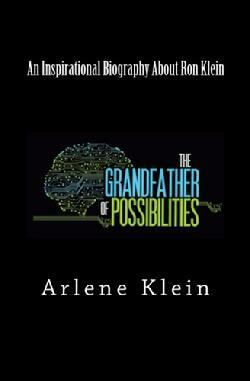 THE GRANDFATHER OF POSSIBILITIES ™ An Inspirational Biography about Ron Klein by Arlene Klein is a little book with a big message. It is a fascinating account of Ron Klein, an ordinary man who accomplishes extraordinary things. With a positive "can do" attitude, he wraps his arms around problems in his personal and professional life. Turning every negative into a positive, he finds a gift behind every challenge. Every page captures the essence of his spirit and determination and his incredible approach to living life to the fullest. His Lessons For Life will inspire you and teach you how to believe in yourself. Ron's inspirational story can help to restore people's self-confidence. It's an example of how a positive attitude gives all of us the capability to rise above our problems and make good things happen. "We’re all capable of moving in any direction we want. If you have a passion for what you do, anything is possible." He is The Grandfather of Possibilities. Ron Klein is truly a "one of a kind!" His incredible perspective on life will inspire you and empower you for greater success in your personal and professional endeavors. I recommend you listen to Ron and learn from him as I have done! It will change your life!!!!" I just read “Grandfather of Possibilities,” the story of Ron Klein, inventor, entrepreneur, artist, musician, creator and indestructible man of good humor. His life demonstrates how to see and turn possibilities into realities. This biography, excellently written by his wife, Arlene, will inspire you to turn your possibilities into realities. Anthropologist, author, co-founder of Woodmere China, Inc. and designer of the private china for President and Mrs. Jimmy Carter and the official china for the Vice Presidents House in Washington, D.C. There are love letters, and there are works of love. Arlene Klein has given us a work of love with “The Grandfather of Possibilities: Inventor – Entrepreneur – Athlete”. This little, 98-page piece, is truly an inspirational biography about the author’s husband, Ron Klein. There is no doubt that Arlene Klein adores her husband, and there is no doubt that Ron Klein is a brilliant and resourceful man. Better than any stone memorial or statue, Arlene Klein has skillfully written of the achievements of her husband, bringing out the radiance of his can-do attitude, his inventiveness, his love for her, their children and grandchildren, their Yorkshire Terriers, and life itself. “The Grandfather of Possibilities: Inventor – Entrepreneur – Athlete” is a short read that would take the average person no longer than two hours to accomplish, but it will be a fun, stirring, uplifting two hours. If you’re looking for a break from the plastic novels, depressing news journals, and brain-crushing technical material, then I would recommend taking a short jaunt into the peaceful waters of “The Grandfather of Possibilities: Inventor – Entrepreneur – Athlete” for a little R and R for your soul. And the next time you use your credit card, you’ll happily remember Ron Klein, and his sunny “Yes I can” outlook. Thanks Arlene. I just have three words for this book. WOW! WOW! WOW! On a scale of 1-5 this book is a 10. It is amazing to read about such a gifted can do man. Ron Klein is someone who won't give up, and can't or never is not in Ron's vocabulary. Ron has accomplished so much in his life, that when I hear the word can't, I just want to say you have never experienced Ron Klein's can do attitude. Here is a man that is in constant pain, but he never gives in, he just continues to do extraordinary things. This book is for everyone who needs a pick-me-up fresh start. Arlene you have done an excellent job writing this book. Michael Monji, author of "Does It Pay To Die? ", a do-it-yourself living trust workbook. The author has presented an incredible, inspirational book for readers. This is the true story of one man who never let anything get in his way - he met his life challenges head-on and inspired others to do the same. As I read this book about Ron Klein, it reminded me so much of my own father. Mr. Klein never had an unkind word to say about anyone, he would give the shirt off his back to help others and he wasn't pretentious. He had a creative mind and was very artistic. As an inventor and someone who could fix anything, Ron was in heaven never having an idle moment in his life. He loved every challenge and encouraged his own children and spouse to find their challenges. His wife Arlene wrote this book about Ron. Every so often he will add his own thoughts as to why he did or didn't do something. It really was like sitting down and having a conversation with both people. The words were easy to read and any reader could relate these experiences of the Klein family to their own. After finishing "The Grandfather of Possibilities" by Arlene Klein I felt very uplifted. this book serves as an inspiration to all who say i can't. if the grandfather can do it so we at least can try. this man is someone who sees challenges and responds to them. he does not let them deter him. today we say think out of the box in solving challenges. this grandfather has done that all his life. a good read for all ages. Such an inspiring life and so delightfully written. I enjoyed every minute of it. Eric Dezenhall, author and CEO of Dezenhall Resources, Ltd. Some people think excelling in one area is simply not enough. "The Grandfather of Possibilities" is the story of Ron Klein. Ron Klein, voted 2003's athlete of the year, well past what most people would consider the prime of their lives, is also an entrepreneur and inventor. Multi-talented and undeterred even still, "The Grandfather of Possibilities" is an inspirational memoir that encourages people to not believe in the word 'can't'. This book is an inspiration for those who can't and those who want to and those who dream, but aren't sure what to do next. Dream big, dream small, dream...but more than that this book inspires us to follow those dreams and DARE. Ron Klein not only saw the possiblities, but turned them into realities. He teaches by his very life. This is a must give gift to some young person in your life. A gift to give to someone who you would like to see inspired to DARE and DREAM and DO. If nothing else, copy down Ron Klein's Lessons for LIfe at the end of the book and frame it and then read it every day!! "Have a passion for what you do" is one of Ron Klein's 14 Life Lessons at the conclusion of this inspirational book by his wife, Arlene. For my entire life as a teacher that is the one lesson I have tried to impart to all my students. Being wealthy, famous, or powerful is meaningless without having a life of passion for what you do. Arlene Klein wrote the most wonderful story I have read in my life. This is not an exaggeration. I believe her story about Ron has changed my view of life's challenges. She describes a man with an attitude that is both passionate and confident. Ron is a genius who has invented things that you might take for granted because they are part of your life. He has always viewed life as a challenge to embrace, never to fear. All the self-help books ever written can be summed by learning of Ron's life and achievements. I have to admit I got a little shy about writing this review. Then I thought to myself, "What did I learn from the book?" The words began flowing here and I believe honestly that reading this book has changed me forever. You discover that Arlene and Ron are two people made of the same stock. They both love animals, family, and each other. Arlene introduces us to a man of incredible talent suffering with enormous pain due to an incurable back injury. At 73 years old Ron has met adversity and overcome it. He has invented things you use and hear about every day. Ron became a Florida Senior Olympian winning numerous titles after logging in 130,000 miles of bicycle riding in 12 years. Yes!!!! You read that number right. It is not a misprint. For most people in their sixties life is a time of slowing down and enjoying retirement. Ron is the man who has redefined what a well lived life looks like and what retirement should embrace. He might just be the model for the future baby boomers who don't know what to do next when they reach retirement age. This is a book of love. It describes both Ron and Arlene's love for dogs over their lifetime. It shows their love for people. Finally, and most importantly it is gift of love from Arlene to Ron for their fifty years of loving each other. I must say that if Oprah Winfrey wants to show the world two beautiful people who can inspire us to a better life, she better put her bid in to interview Ron and Arlene. I know in my heart that in a short time somebody will. Read this book. Reread it again. Give a copy to a friend out of love. Frame Ron's Lesson's For Life and keep a copy nearby. I really enjoyed reading this book. It is well written and truly kept my attention. What an inspiration Ron Klein is to others! His positive attitude and thirst for learning enables him to achieve whatever he sets out to do. I felt his "Lessons for Life" can be beneficial information for anyone.